Urban landscapes are filled with trees that are planted to deep. When a tree is planted at the wrong depth the root flare is below ground level. The root flare is a very important part of the trees transportation system. It is the area where the cells from the roots and the cells from the main stem meet and disperse important moisture and nutrients. To insure the health of a tree this area must be visible and void of excess dirt and mulch. When a tree is planted to deep it will often promote adventitious roots from the flare or the main stem. These roots will cross or encircle the stem and flare. As these roots increase in diameter they compress the sapwood and will cut off the flow of moisture and nutrients. This disorder is called Stem Girdling Roots (SGR) and is one of the primary causes of tree decline in our urban landscapes. Without treatment, SGR’s will prove fatal to the tree. Prevention is the best solution, but for trees already planted, early diagnosis of visible symptoms is essential for future tree health. Trees without a visible root flare at soil level are symptomatic of the disorder and are at risk to develop roots that may girdle the trunk. Diagnosis can also be based on tree species. For example, maples and lindens are more prone to the disorder than are oaks. To assess the situation, root excavation is necessary. 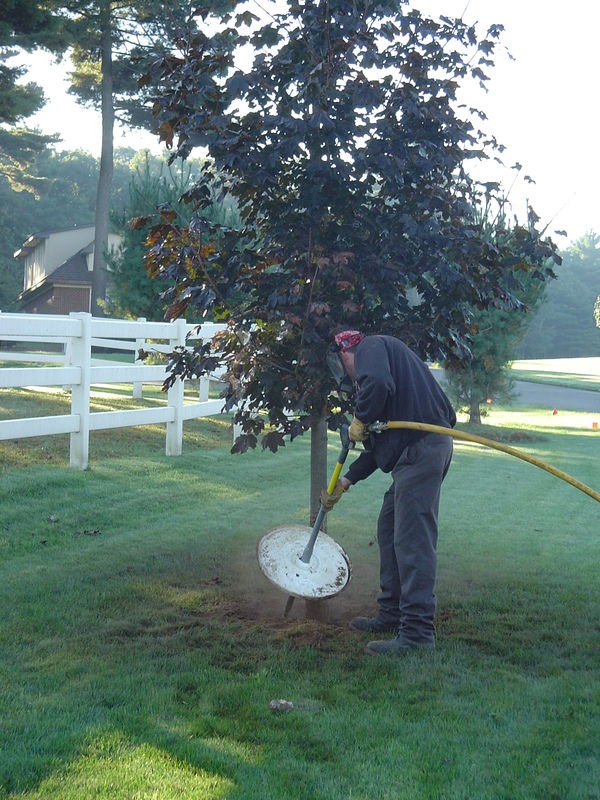 An Air-Spade® is used to blow debris and soil away from the base of a tree, exposing the root collar. This evaluation determines the possibility of improving a trees’ condition. If it is determined that problematic roots may be safely treated, surgical cuts are made to the roots impacting trunk growth. It may be necessary to leave some offending roots, as only roots that do not affect tree stability and structure will be removed. There must also be enough roots left intact to provide sufficient nutrient/water uptake. If tree stem compression by girdling roots is too severe, removal of the tree is the only option. evacuate soil in preparation for a root flare inspection. 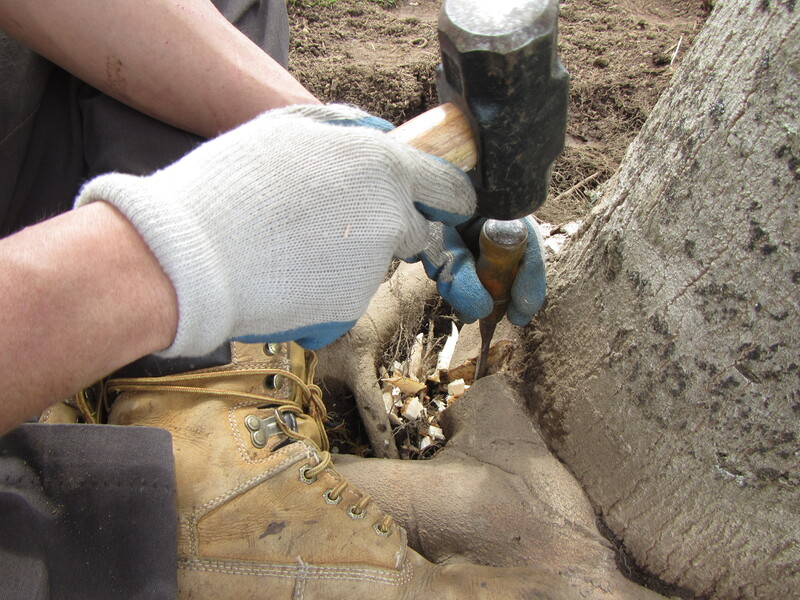 hand tools to protect the tree.